Neurofax µ EEG-9100 is a Windows® 7 notebook PC based EEG with high performance and expandability with optional hardware and software. Neurofax µ allows EEG testing anywhere. 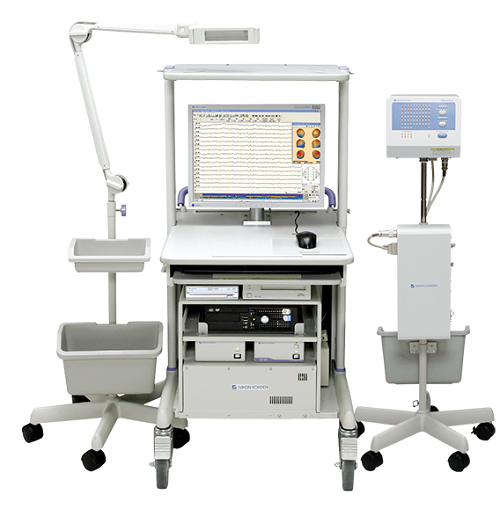 Neurofax µ is a complete and ready to use system. It comes with a notebook PC unit, isolation power supply, advanced electrode junction box and necessary standard accessories and standard software. A complete range of optional accessories and cart are also available. Quality EEG recording is assured even in the electrically noisy OR or ICU. Neurofax µ has high performance, high sensitivity amplifiers, high frequency and simultaneous sampling, an ECG rejection filter, shielded electrodes and a high performance electrode junction box with USB connection. 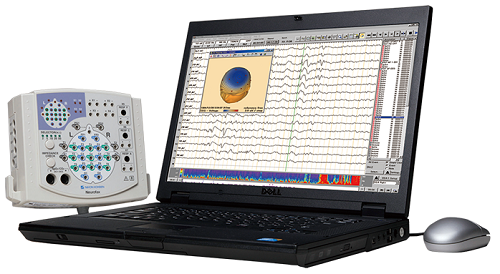 Add polysomnography to your EEG/EMU environment with Polysmith Software The Nihon Kohden EEG-9100J/K with PSG offers the channel set to provide your facility the best of both worlds. Capable of working independently as an EEG or PSG system or as a combined unit, Nihon Kohden offers a full range of hardware and software features to fit your needs by providing easy to use analytical software, flexible montages, built-in SpO2 and EtCO2, photic and more. To meet your epilepsy monitoring needs as well as expand your PSG capabilities, your EEG-1200 combo system can be expanded to record 64, 128 or even 192 channels. Junction box for routine EEG and PSG. Integrates 32 channel EEG input and SpO2/ETCO2 inputs. High expandability with a wide variety of hardware and software options gives you the capability to handle routine EEG recording to high level brain function research. 256 channel simultaneous sampling EEG with 300 channel display capability. Excellent performance for routine EEG exam rooms as well as epilepsy centers, sleep labs and research facilities. Nihon Kohden introduced the world’s 256 channel system. You can also choose 32, 64, 128 or 192 channel electrode junction boxes for mini flat junction boxes are also available to enhance the patient’s comfort. The JE-120A, electrode junction box has a high sampling rate up to 10 kHz. The Nihon Kohden EEG-1200 with PSG offers the channel set to provide your facility the best of both worlds. Capable of working independently as an EEG or PSG system or as a combined unit, Nihon Kohden offers a full range of hardware and software features to fit your needs by providing easy to use analytical software, flexible montages, built-in SpO2 and EtCO2, photic and more. To meet your epilepsy monitoring needs as well as expand your PSG capabilities, your EEG-1200 combo system can be expanded to record 64, 128, 192 or 256 channels.